Spacious and brand new 2 bedrooms apartment, tastefully decorated, very elegant. High standards. Perfect for delegates (5 minutes walk from the Palais des Festivals) and tourists (7 min walk to the beach). Maximum capacity: 4 people. One double bedroom (with Queen-size bed), wardrobe. The other twin bedroom has two separate beds. One bathroom, one separated WC, one fully equipped kitchen (dishwasher, Nespresso, electric wine cave, etc ...), one living room with desk, flat screen, terrace... you will find everything to make you feel at home. You will enjoy the sunset in the 8m² terrace, west exposed. Close to everything (supermarket, bakery, butchery, the famous Forville market, ...) in a quiet neighbourhood. This apartment is managed byIMMOGROOM. Our staff will welcome you upon arrival and will be happy to answer all your needs to make your stay even more enjoyable. Forville market is placed behind the town hall and next to the Suquet. You will find there all local products, fresh and very good quality. It is unlikely to meet the cooks in search of the best ingredients. Excellent apartment, only let down was the toilet which did not have a sink to wash hands and the bathroom where we could not hang out towels anywhere and there was not enough room for 4 people to put their toiletries. The rest of the flat was perfect, in a very good location . Carre Vendome NW - great awesome place to stay!!!! This place is exactly as promised and more! You combine a great location, picturesque view and amazing interior, and this is what this place is. I was simply looking for a place to relax from the busy conference and instead felt like I was on vacation with the view and accommodations. I would highly recommend this place to anyone looking for a business escape or vacation hideaway. 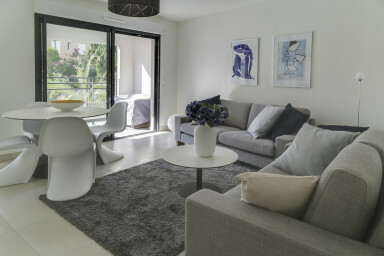 Très bel appartement tout neuf dans un coin très calme de cannes... mais tout proche des commerces ou restaurants! Tout y est pour être bien: appareils, accessoires etc... Rien à dire!